Mr. Bolling's salutes to Duke Ellington and recordings with Stephane Grappelli have much to offer for big band jazz fans. 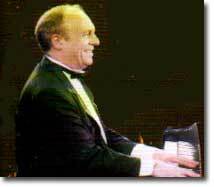 Pianist, composer, arranger, and big bandleader Claude Bolling is one the most famous French musicians in the world. Although his passion is jazz, he is also an accomplished composer of pop music and has written numerous film scores. While born in Cannes on April 10, 1930, Claude Bolling has always lived in Paris. During the German occupation of France he received musical training from Marie-Louise �Bob� Hake, pianist, trumpet player and drummer in one of the many female orchestras � la mode in the inter-war period. Claude Bolling was introduced to the magic world of jazz by a schoolmate friend and became enamored with the music of Thomas Fats Waller. At just 15 years old he gained recognition and high marks at an amateur contest organized by Jazz Hot and Hot Club from France in Paris. He soon became interested in the music of several other masters of the piano like Willie �The Lion� Smith and Erroll Garner. Most influential to young Bolling was one of the early pioneers of the stride style of piano playing, who went on to lead a successful big band during the Swing Era, the great Earl �Fatha� Hines. Claude Bolling organized his first band at 16 and cut his first records at 18. He soon felt the need to expand his knowledge of music and Germaine Mounier (traditional piano), L�o Chauliac (piano jazz), Maurice Durufl� (harmony), Andr� Hodeir (counterpoint, orchestration, writing jazz) became his formative masters. After serving in the French military, where he played trombone and percussion, Bolling determined to make jazz his profession and he began playing in such bustling French jazz establishments as the Club Saint-Germain, Vieux Dovecote, and Caveau of Huchette. Soon he was performing and recording with many famous American jazzmen who passed through France (Rex Stewart 1948-9; Roy Eldridge 1951, 1961; Don Byas 1951; Lionel Hampton 1953, 1954, 1956; Coleman Hawkins 1961; Albert Nicholas 1955; Cat Anderson 1964) and the name Claude Bolling became synonymous with the word jazz in Paris. It was through his presence as one of the leading French jazz musicians that Mr. Bolling began an association with Boris Vian, for whom he wrote arrangements for Possible and Impossible Songs. The success of the disc thrust Bolling to the forefront of the French pop music world. Several famous French pop artists from the 1950s and 1960s entrusted their musical direction to him as he was called upon to help produce albums for Sacha Distel, Jacqueline Francois, Juliette Greco, Henri El Salvador, and Brigitte Bardot. His success with the music score for the film The Day And The Hour allowed Bolling to begin a noted career as a composer of film music. He has, to date, written more than one hundred scores of which some were immense successes such as Borsalino, Louisiana, Flic Story, The Splendid One, The Awakening, and California Suite, to name a few. In the 1960s Bolling also began composing for French television shows like The Brigades Of The Tiger, Gar�onne, and The Clan. While the talent of Claude Bolling has been expressed in many forms of music, he remains at heart a musician of jazz and a lover of ragtime, of boogie-woogie, and of the orchestrations of Duke Ellington and Sy Oliver. The pianist Claude Bolling, at times, takes a back seat to the big bandleader Claude Bolling; his dream of leading a big band having been realized in the 1950s. The Claude Bolling Big Band of today is comprised of talented musicians, several who have remained with him for many years. It celebrated its 20th anniversary in 1996 and made a tour of the world playing to large audiences in the United States, in Asia, in South America, and in Mexico. Bolling's aggregation owes much to the influences of Duke Ellington, Count Basie, Jimmie Lunceford, and Glenn Miller but its albums also present the leader�s own compositions written in the respect of a great tradition. Through its performances the band displays a deep reverence for some of the greatest personalities in jazz history, such as singers Joe Williams and Carmen McRae (whom a Bolling-led orchestra backed in France during 1979), Dee Dee Bridgewater, and the great instrumentalists like William �Cat� Anderson (tp), Dizzy Gillespie (tp) Jon Faddis (tp), Sam Woodyard (dm), Rhoda Scott (organ). In recent times several albums exhibit just such influence and are �must have� releases for lovers of modern hi-fi big band jazz that swings. Bolling�s tip of the hat to Duke Ellington on Bolling Plays Ellington Volumes 1 and 2 (CBS 1986, 1987) is a dynamic expression of his admiration and understanding of the work of �the Maestro� and of how to swing big band jazz. His meeting with St�phane Grappelli in 1991 for the album First Class (Django d� Or 1993) is another great phonographic success. These issues allow the Claude Bolling big band to rightful take its place at the top of the list of modern day big band jazz orchestras, paralleling the great big bands to which it walks in stride with. Today Claude Bolling occupies, by the reflection of his persona and accomplishments, the role of roving French ambassador of jazz throughout the world. He is of the same class and school where came the other two grand French masters of jazz, Django Reinhardt and St�phane Grappelli.